Mels regenerates in "Let's Kill Hitler". In the premiere of the 2009 spin-off series K-9, the original K-9 Mark I (Leeson) is reintroduced and destroyed, but subsequently revealed to have been installed with a "regeneration circuit". At this point, the traditional K-9 model "regenerates" into a more sophisticated-looking CGI model. In "The Doctor's Daughter" (2008), the Doctor's DNA is used to create the titular "daughter" Jenny (Georgia Moffet), who displays many but not all Time Lord traits. In the episode's close, she is shot in the chest and appears to die. However, long after the Doctor and his companions have departed, she miraculously resurrects and expels energy from her mouth which, ambiguously enough, both resembles regenerative energy and the energy emitted by a planet-restoring plot device in the same episode. The question as to whether this is a true regeneration is left unanswered, since Jenny does not change her appearance. In "Day of the Moon" (2011), a child (Sydney Wade) walks through a New York City alley at the end of the episode. When a vagrant asks of her condition, she explains that all is well, that she is dying, but she can fix it. 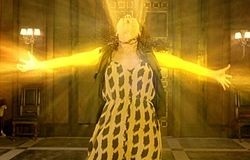 She subsequently begins to regenerate in the style of the revived series. In "Let's Kill Hitler", it is revealed that this child was Melody Pond and that she regenerated into a toddler (Maya Glace-Green). This form later matured into Amy Pond's best friend, Mels (Nina Toussaint-White), who again changed into the Alex Kingston form of Melody (River Song). In the aforesaid episode, post-regeneration, Melody is immune to a barrage of gunfire due to her surplus regenerative energy. Transference of regenerative energy In Mawdryn Undead (1983), it is first referenced that a Time Lord could transfer his regenerative life essence to another being. In that story, the Fifth Doctor is coerced by Mawdryn to give up his future regenerations in order to cure Nyssa and Tegan Jovanka from Mawdryn 's disease. Although, the transfer did not occur (due to the timely interference of The Brigadier) the Doctor stated that the consequence of the transference would be that he would sacrifice his eight remaining lives and cease to be a Time Lord. It is not until "Let's Kill Hitler" (2011) that such a transference is shown. In that instance, River sacrifices her own regenerative power in order to save the Eleventh Doctor. A major plot point of the 1996 TV movie involves the Master scheming to steal the Doctor's remaining regenerations for himself.